It details the common services deployed in the network and aims to reduce the gap between resources and applications. 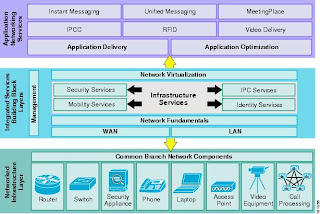 SONA incorpates a Network Infrastructure layer, Interactive Services layer, and Application layer. That's about it. Visit cisco.com for more information. A bridge is a two interfaces device that creates 2 collision domains, since it forwards the traffic it receives from one interface only to the interface where the destination layer 2 device (based on his mac address) is connected to. With all this information, you can say that on your diagram, there are 2 broadcast domains (1 router that separates 2 LAN segments composed by one or many switches, with only 1 VLAN per segment). There are 8 collision domains, one per pair of devices connected to each other (switch to router, switch to switch, switch to computer etc...) since we are talking about layer 1 concept (physical connection).